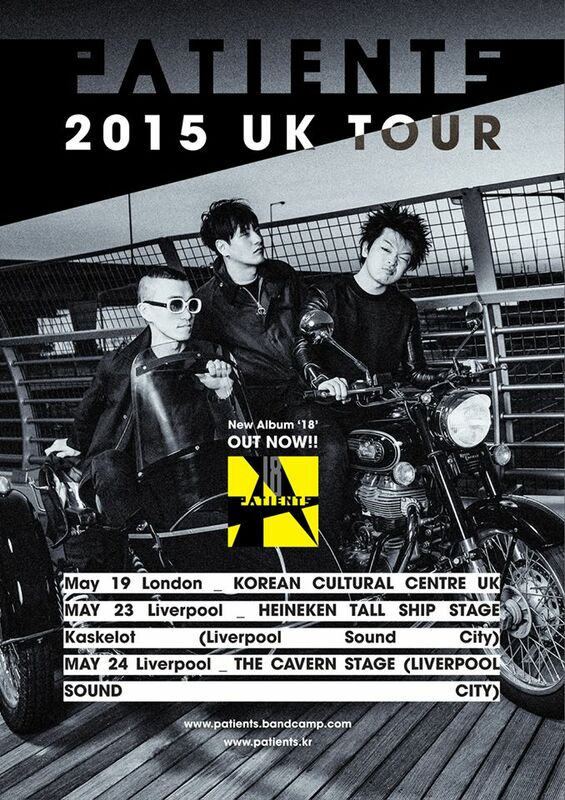 Korean hybrid punk trio PATiENTS return to the UK this week to play a small number of shows. Last year we spoke to frontman Sumin Jo, both the vocalist and bassist for PATiENTS, and we were able to catch up with him again as the group prepare to tour the UK. Beginning tomorrow at the Korean Culture Centre in London, the trio will then head to Liverpool for two stages at the city’s Sound City Festival. For the UnitedKpop readers that may not have caught our first interview with you, can you introduce Patients and your ‘hybrid punk’ style? Hi! We’re Patients, a punk trio from Seoul. We toured the UK in spring of 2014, and will be returning for more gigs this month. We just released our sophomore full-length effort, 18, and will be playing songs from it during our upcoming UK shows. When making music, Patients mix elements of classic punk rock with other sounds we love. We call this unique pairing ‘hybrid punk.’ It’s our own style of music, so we thought it should have its own name! Since we saw you last year what have Patients been doing? Last September we embarked on our first Taiwan tour. We had a great time there, and performed in three different cities. One of those shows was an appearance at a cool festival called Beastie Rock Festival. After playing in Taiwan, we began working on 18. We started recording the album in September 2014 and finished working on it in early April. The album came out on April 29. We’re really proud of it and hope music fans in the UK will enjoy it! You just released your new album, 18. Does its title relate to word play around the Sino-Korean 18 and a curse word, or does the number 18 have deeper meaning for Patients? It relates to the curse word! For those who don’t know, the Korean pronunciation of “18” is “sipal” and has a very similar meaning to the word “f#ck.” Just like the way many English speakers use the word “f#ck,” Koreans say “sipal” when they are very happy and very annoyed or angry. Because of the multiple usages of the word, we thought it was a fun title. As well, the number “18” can be read anywhere in the world so we thought that made it a good title too. Patients want to continue to push ourselves to do more things overseas, so we thought having a title that could be read by everyone – regardless of what language they speak – was a good idea. Last year you told us about opening Steel Face Rooftop 3639 in Hongdae, what has the response been to your rooftop venue? Bands and audiences love it! But sometimes the police don’t and they come because of noise complaints! But that just makes it more rock ‘n’ roll, right? Every band that has performed at Steel Face Rooftop 3639 has loved the experience of playing on a rooftop. Most of the live clubs in Seoul are in basements, so getting to play high above the streets of Hongdae is exciting and fun for Korean indie musicians. I’m happy we’ve been able to make a cool live space for musicians and audiences to enjoy. If you’re ever in Hongdae, and there’s a gig happening on Steel Face Rooftop 3639, please stop by and check it out! Liverpool’s Cavern Club is considered hallowed ground for musicians, how do you feel about playing on a stage at Liverpool Sound City named after such a famous venue? After playing at Liverpool Sound City last year, we couldn’t wait to play at the festival again! We were so thrilled to hear that we could come back to the festival this year. And then we got even more excited when we heard about the two stages we’ll be playing on. In addition to performing on The Cavern Stage, we’re also going to play on The Heineken Tall Ship Stage (Kaskelot). Both stages sound like they are going to be amazing! Our hearts are pounding with anticipation for these shows, and we promise we’re going to play awesome at both. Did you learn anything about the UK last year that will influence your upcoming trip and gigs? Our UK tour last year showed us just how powerful music is. Since most of our songs are written in Korean, we figured people wouldn’t be able to understand our music because of the language barrier. But I was wrong! People were able to understand us from our sounds and energy. It was amazing to experience this. When we went back to Korea, we concentrated on making stronger sounds and adding more energy to our songs. That happened because of our UK tour. Is there a track from your new album you’re most looking forward to performing during your UK tour? I’m really excited about being able to play “Sipalsegi.” It’s the first single off of 18. I hope people enjoy the song. Of course, UnitedKpop is home to KPop fans. Why should they listen to 18 or check out one of your live shows whilst you are here? Our new album 18 will take you to a better place and make you feel happier! It’s important for people to feel good, which is why we wanted our album to be filled with upbeat, energetic sounds. Please check the album out and be happy! Oh, and please come hang out with us while we’re in the UK! We love making new friends. Hope to see you at one of our shows! You can see PATiENTS play in the UK in both London and Liverpool. Their new album 18 is available via iTunes and Bandcamp where you’ll find it at a reduced price.